Deploy software across your organization efficiently and consistently with our comprehensive deployment checklist. Sort deployment tasks into stages. When you can categorize and sort to-dos into clear groups, you can easily find work again, and see it in a way that makes sense—which helps productivity. Collaborate with vendors and internal employees. Make expectations for vendors, your team, and employees clear by inviting them to the project and assigning tasks with deadlines. Manage your project in one place. By planning and managing your deployment from one tool, you can see your plan, important documents, progress, and blockers all in one place. Spreadsheets and docs can’t cut it. Efficiency, consistency, and cross-functional alignment are key not just to successfully implementing new software, but to meeting your company’s objectives. Make sure your team has it all with a checklist template you can adapt and reuse every time, and the right tool to manage it all in. How do you set your vendors and suppliers up for success? Our onboarding tips explain how. Track the progress towards each deployment in one place with Portfolios. We’ll show you how. Still working in email with vendors? Keep deployment conversations actionable with our integrations. 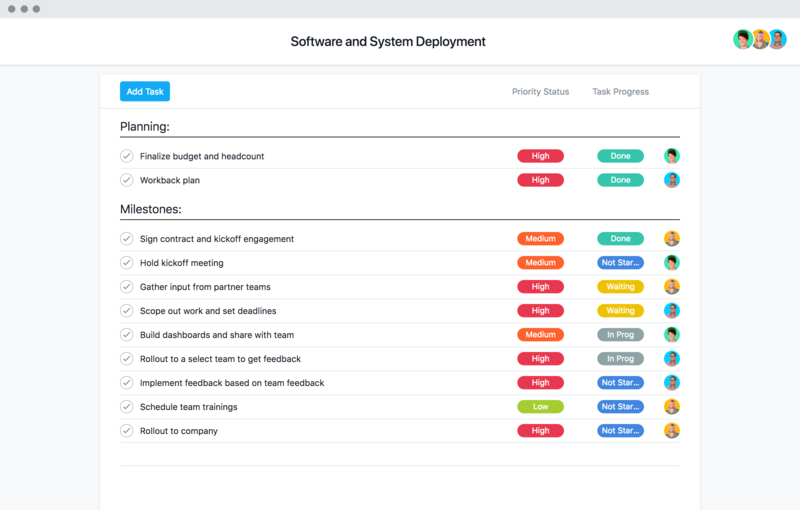 Asana Premium has the features IT teams need for deployments, project management, and more. Start a free trial today.